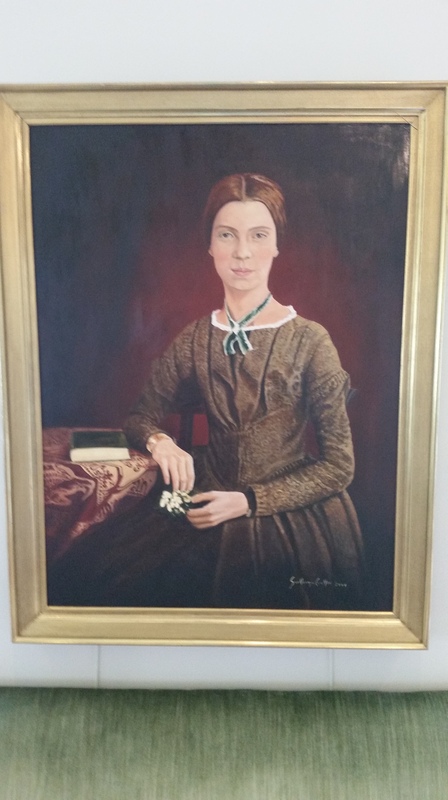 Emily Dickinson’s portrait in the Dickinson/Frost collection of Jones Library, Amherst, Mass. 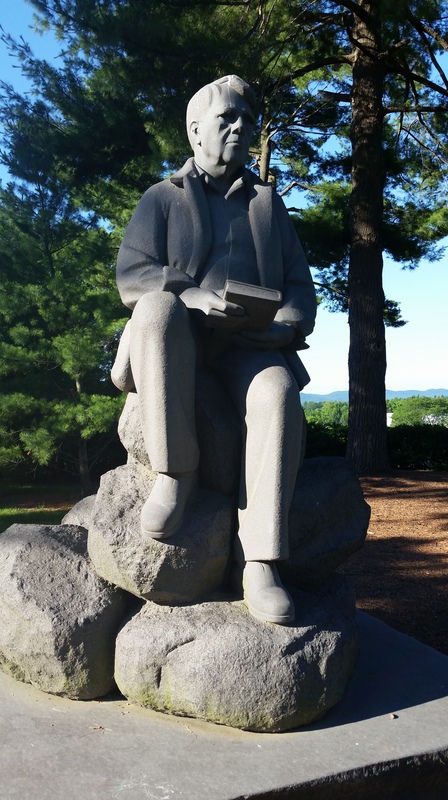 Recently, I attended the Juniper Writing Institute at University of Massachusetts in Amherst. For the unaware, Amherst is the hometown of one of the canon’s most memorable and memorized poets, Emily Dickinson. Also nearby, one can find the farm of another great American poet, Robert Frost, considered by many to be the landmark poet of the 20th century. Both of these poets have meant a great deal to me as a writer throughout my career, and being in their part of the world was an unforgettable experience. I am awake because Emily Dickinson will not leave my mind. Having visited her house yesterday, I keep seeing her small corner bedroom over and over: its little sleigh bed, its dresser, its white-knobbed doors. 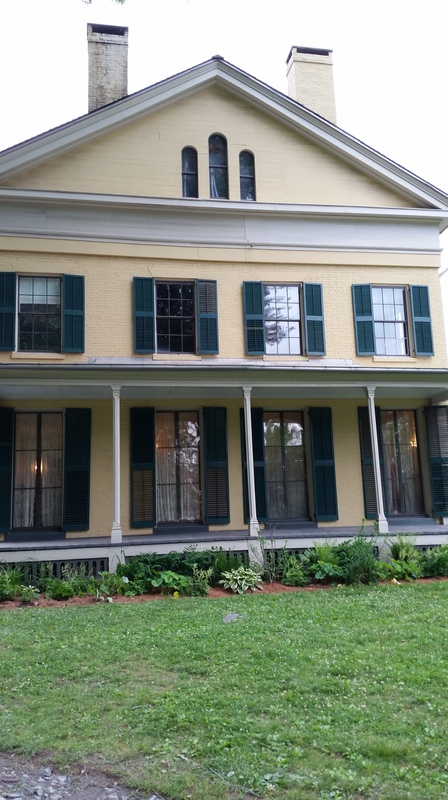 The Dickinson House in downtown Amherst. Most of all, though, I think of all its windows. The tour guide kept using phrases like “extraordinary fenestration,” and she did not exaggerate. The natural light in Emily’s room was almost church-like. White and spiritual, it seemed to give life to the broad, thick beams of hardwood flooring there. As old as everything was, the light carried no dust. The air in her quarters was as pristine as the white housecoat she sewed for herself. On that air was the scent of history, a rare mixture of old wood, natural fibers, and unstirred earth. What idea or notion do you “dwell in,” and why? A collection of Emily’s things at the Jones Library in Amherst. So, I was at my most honest in the middle of the night. But my thoughts of leaving a literary trail for others to follow would not stop with Emily. 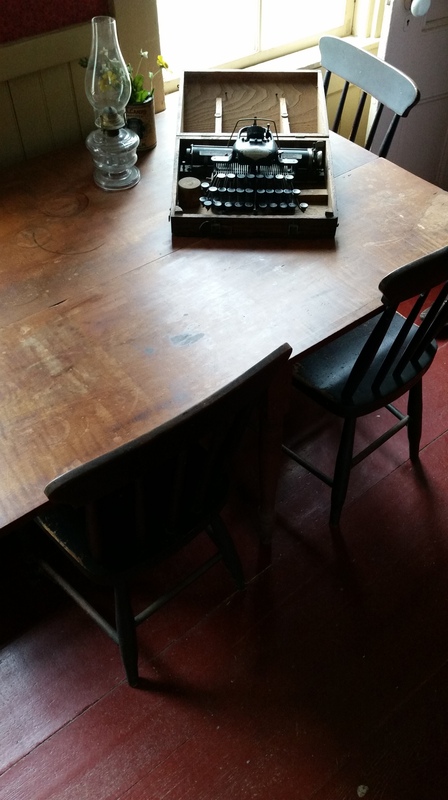 No, not when the home and writing space of one of my all-time literary heroes was nearby. Upon my visit to the Frost Farm in Derry, New Hampshire, I was privileged to see his barn, his house (both floors!) and the land surrounding. I stood where the great man stood, walked where he walked, and even trod the staircase his wife descended, prompting the poem “Home Burial.” All these experiences once again raised the concern of posthumous impact. Would people want to similarly experience the spaces where I have created? Will my own work ever merit that kind of attention, before or after my death? 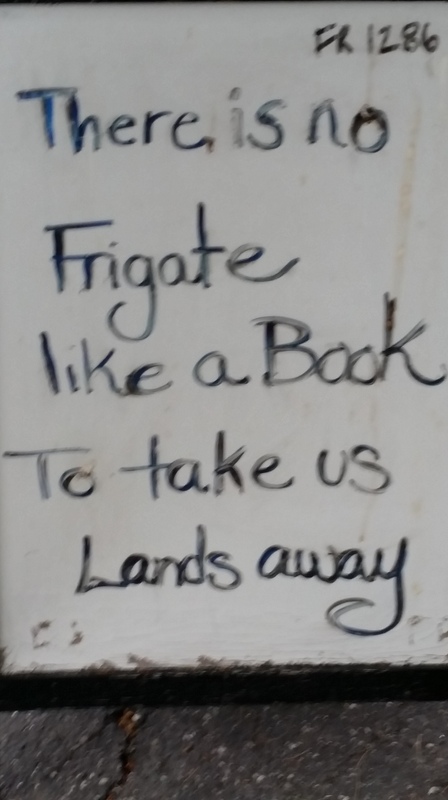 The literary marketplace is full of Frost-wannabes and Dickinson-aspirants, and who am I to even ponder such weighty matters? How does proving oneself a “fanboy” of literature make one any more likely to succeed at literary and scholarly endeavors? And thusly, I tortured myself further. 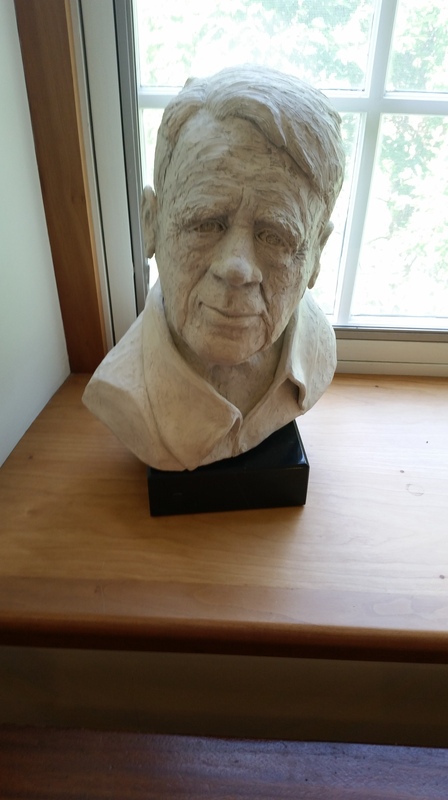 I visited the Robert Frost Library. 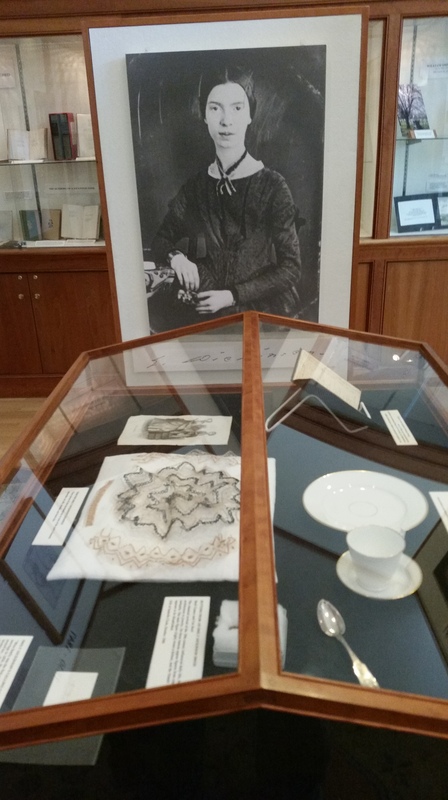 I spent hours perusing the Frost-Dickinson collection in the Jones Library of Amherst. I allowed my imagination to run wild with scenarios concocted only from the notion of greatnesses recognized. And once again, I found myself twisting my brain into the same enigma that it has puzzled over like a Rubik’s Cube countless times before: Will I matter? Will my work matter? How do I ensure both? What steps must I next take to be certain that I’m not forgotten, like so many writers of the past? A sign on the grounds of the Dickinson House in Amherst. This passage is directly from Emily’s poetry. A bust of the great man himself inside the Dickinson/Frost collection at Jones Library. I had hoped by now, at my nearly 40 years of age, that such concerns would really be a thing of the past. After all, I continue to write, and I’m sure that one day I’ll see some wider recognition than my meager efforts have so far produced. Like all writers, I’d like a Pulitzer and maybe some other big awards (see prior posts), but honestly, at the end of the day, what I’m really aiming to do is preserve people, times, and places that have mattered to me the most. If my poetry results in just a few people gaining a broader appreciation of the heritage, values, and experiences I’ve received in this life, then I’ve won. And I don’t mean that all of my poems are totally autobiographical — certainly many are not. But all of them lend themselves toward ideas, visions, and perspectives that, however universal, have arisen somehow from the life I’ve lived. Will people care about that life? Why should they? Will students sit through laborious documentaries about the different periods in my writing timeline? Will my work be anthologized in textbooks of the future? Such inquiries can drive one mad, if left unchecked. Spending countless hours in the homes of the greats might not make me a better writer, but it did accomplish one thing — it allowed me to see a shared humanity, a common thread of inspiration, motivation, and dedication. Persistence, diligence, and enormous creativity are shared traits among those we celebrate today, so long after their earthly departures. And perhaps it is these traits that we should take away from memorials and museums commemorating their contributions. More than the vanity of asking, “How can I attain their level of distinction?”, perhaps we (I) should be asking, “What can I do continuously and creatively well to positively affect my world?” Such a question surpasses the superficial desire for remembrance, and enters us into a more philosophical, even theological, realm. May our answers lead us not to fame, not to fortune, and not to solipsism. Rather, may they lead us to be better human beings, produce finer work, and seize the opportunities of the everyday. Robert Frost’s writing space at Frost Farm in Derry, N.H.
A statue of Frost just outside the Robert Frost Library at Amherst College.